It goes without saying that the only way to get better at something is to do it a lot. It doesn’t matter whether you’re an athlete or a carpenter, a musician or a painter; practicing your craft is essential to developing what it takes to be great. As recording and mixing engineers, we’re held to the same human standard as everyone else when it comes to getting better at what we do. And in order to practice, we need (preferably) free multitracks to get us up to speed! Before we get to the good stuff, let’s take a moment to ensure we know exactly what we’re referring to. To put it simply, multitracks are the individual recorded elements of a song, and may be stereo or mono. Using a four-piece rock band as an example, the recording engineer likely miked the kick, snare, hi-hat, and overheads; the vocalist; the guitar amp; and the bass amp. Each of these recorded signals comprises a separate track, of which there are 8 in this case. All of them together are a multitrack audio production! Multitracks are often unprocessed to give the mixing engineer the greatest amount of flexibility when it comes time to put the puzzle together. That is, they’re free of extensive EQ & compression and time-based effects that come into play during the mixing stage. When tracking with outboard equipment, an engineer may print some subtle effects on the way in. However, the majority of processing is saved for mixing! It’s important to note that multitracks differ from stems. Stems are stereo bounces of pre-mixed elements. For instance, a drum stem would be a single stereo track of the entire recorded kit. 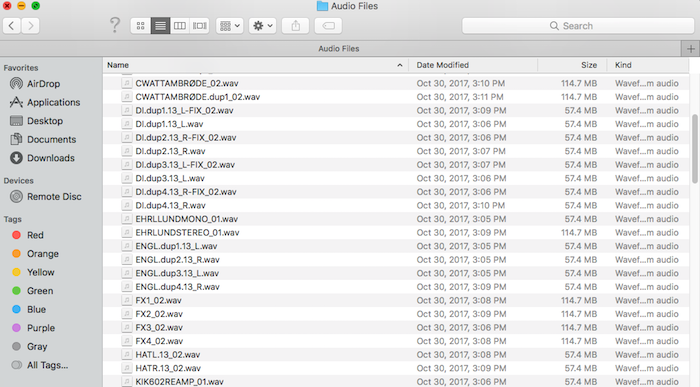 While stems are useful for consolidating pre-mixed elements in a large session, they’re not of the greatest use when it comes to practicing our mixing skills. This is because a mixing engineer already committed to signal processing choices and printed his or her tracks as a stem. The ability to individually manipulate the kick, snare, hi-hat, etc., with multitracks is where we really learn what we’re doing! Sessions comprised solely of stems are typically created after the entire mixing process (which was done with multitracks, of course). Okay, now here’s the good stuff! Below is a list of websites that offer free multitracks for mixing engineers to practice with. This is an extensive collection of recordings in a wide variety of genres. Think everything from dubstep to orchestral, and from metal to hip-hop. It’s important to keep an open mind as a mixing engineer, especially when working with clients whose music you may not love. I’d encourage anyone to find something in this library that you wouldn’t ordinarily listen to and have a go at mixing it! German microphone and pro audio manufacturer Telefunken provides the free multitrack sessions from their music video series, “Live from the Lab.” Each session is recorded at their facility in South Windsor, all with Telefunken microphones (of course!). This is not only a great way to practice mixing, but also the perfect opportunity to “demo” the company’s range of mics. MixOff is a forum and community of mixing engineers in which members frequently upload multitrack sessions for others to access. In addition to these sessions, members have the opportunity to discuss techniques, ask questions, and learn from each other–much like how we operate at Produce Like a Pro! HomeRecording has a forum very similar to MixOff called Mix This!. You can frequently find posts containing multitrack sessions, like one member’s cover of “A Long December” by Counting Crows. Again, this is a supportive community where sharing your own work for others to mix is encouraged. Don’t forget that we offer a free bundle of goodies, including multitracks and drum samples, here at Produce Like a Pro! The free multitracks above provide access to hundreds of sessions at absolutely no cost. As important as it is to have a DAW, a pair of headphones or monitors, and a good set of ears, nobody is a mixing engineer without material to work with! Sure, there are loads of premium memberships available, but at the end of the day it’s sometimes difficult to spend the money on multitrack resources. Luckily, there is more than enough free material on the web to keep most of us occupied for the foreseeable future! Of course, this is by no means a comprehensive list of all the free multitracks floating around the web. It’s a great place to start, but if you know of any not mentioned here, or you even supply your own multitracks, feel free to post them in the comments!